It is important to appreciate what nature can provide without necessarily having an influence from human beings. Rainbow is one of the phenomenons that are not controlled by human beings. It is natural and beautiful to look at. In a nutshell, rainbow appears in 7 different colors i.e. Violet, Indigo, Blue, Green, Yellow, Orange and Red; pronounced as VIBGYOR, as a result of interaction between sunlight and water. This is why it is mostly visible when there is a sunny rainy day. Rainbow formation involves physical phenomenon which includes dispersion, refraction, reflection and internal reflection. For this to take place there must be interaction of sun water and air. This occurs when the rays from the sun comes into contact with the rain drop but at a certain angle. Light from the sun hits the water droplets at a certain angle. This is why the rainbows forms mostly during dawn or late afternoon since it provide the ideal angle to form the rainbow. The angle formed is very important since it determines whether the rainbow will be formed or not. 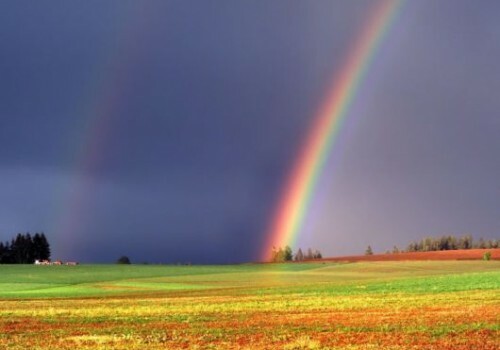 When the angle is not appropriate, we are then not able to see the rainbow. When the rays from the sun hits or comes into contact with droplets of water, the light from the sun is reflected. In the process, a number of things take place whereby the light obeys the law of reflection. The light that was not refracted crosses the boundary of air and water, causing a slow speed since water is denser than air. This reduction of speed makes the path of the light to bend, which is called refraction. This is why the rainbow is always curved/bent. You can see the below video to see how rainbows are formed. The dispersion of colors follows as a result of different in speed. Since wavelength travel at different speed, this brings about the dispersion of colors and that is why rainbow has got different colors. When light hits water-air interface at the rear of raindrop, it forms an angle. 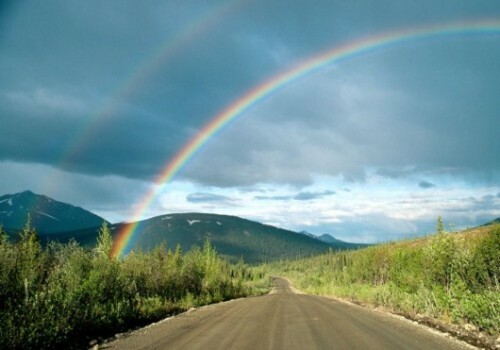 If by any chance the angle is greater, reflection occurs, a reason why we will be able to see the rainbow. On the other hand, if the angle is lesser than the critical angle, the rainbow formed will not be visible. As the light leaves the raindrop, it changes the speed. Since at this point light is moving away from a denser to less dense medium, the speed is thus enhanced. The increase in the speed causes the light waves to bend. This is a refraction which contributes to the shaping of the rainbow. The rays gets more refracted which enhances the distinct formation of the rainbow colors. With more separation and refraction, the distinct colors and shape of the rainbow is visible with dispersion. This is how the rainbow forms. Remember, all the steps as indicated above leads to the next step until the end product of having a visible rainbow.